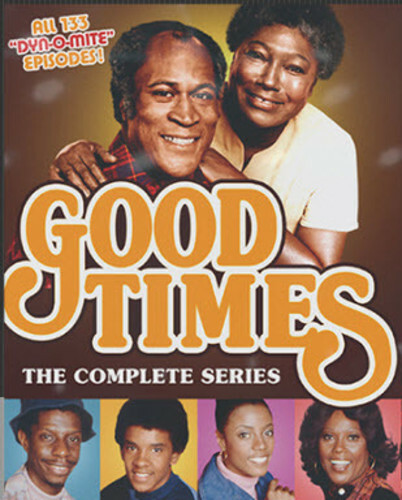 Enjoy old-school laughs and tears with one of TV's smash sitcoms from the '70s, Good Times: The Complete Series. Developed by legendary producer Norman Lear (All in the Family, The Jeffersons, Maude), Good Times centered upon the Evans family living in an inner-city project in Chicago. James (John Amos) and Florida (Esther Rolle) struggle to make ends meet while raising their three children, JJ (Jimmy Walker), Thelma (Bern Nadette Stanis) and Michael (Ralph Carter). Despite the economic difficulties they face, the Evans family, along with their downstairs neighbor Willona (Ja'net Dubois), always kept a positive attitude. All 133 Dy-No-Mite episodes!